Scientists tell us that around 14,000 years ago North America was the home of large populations of mammoths and mastodons. These creatures were the relatives of the modern Asian and African elephants. Some, like the Colombian mammoth, were larger than even the largest elephant known today. Others, like the woolly mammoth, had strange features for an elephant, like fur and a hump on the back. All mysteriously disappeared about 12,000 ago and nobody knows exactly why. Mammoths were not the only creatures to disappear around the time. From about 132,000 years ago until about 10,000 years ago (a period known as the late Pleistocene era) many extremely large mammals, collectively known as megafauna, went extinct. This included sabertooth tigers, the giant short-faced bears, giant sloths, giant camels and the huge dire wolves. Unlike the dinosaur extinction of 65 million years ago, nobody has found evidence of a single large meteorite strike to explain this extinction. Most scientists point to changes in climate to explain the death of these animals. The late Pleistocene era is the time before, during, and just after the last great Ice Age. During that period, gigantic sheets of ice covered much of North America, Europe and Asia. Some scientists suggest that these harsh, cold conditions of the time gave the megafauna an advantage. When the Ice Age came to an end, so did the mammoths, along with many other animals. Not all scientists accept this theory, pointing out that these mammals had survived even bigger climate changes earlier. Indeed, some of the relatives of the mammoths, the elephants, survive in India and Africa today. If they could make it, why couldn't the North American mammoths and mastodons? A second theory is known as the "Pleistocene overkill" hypothesis. About the same time mammoths and mastodons were becoming extinct in North America, scientists think early man crossed over the Bering Straight from Asia and began to populate the Western Hemisphere. According to the theory these groups over-hunted the mammoths causing their extinction. Because the mammoths and mastodons probably had long gestation periods, they might have found it hard to maintain their populations with new births if they were constantly being hunted. Examinations of early dwelling sites from that time show that the mammoths were hunted for food to at least some extent by the Clovis people. The Clovis moved into North America around 11,500 to 14,000 years ago. By comparing the location and age of Clovis dwellings with mammoth and mastodon fossils, scientists found that whenever the Clovis populated an area occupied by mammoths and mastodons, these animals began to die out. Scientists also note that the mammoth remains from that time show spiral fractures of the bones which were probably caused by heavy blows right before or after death. These might have been caused by human hunters trying to break open the bones to get at the nourishing marrow inside them. 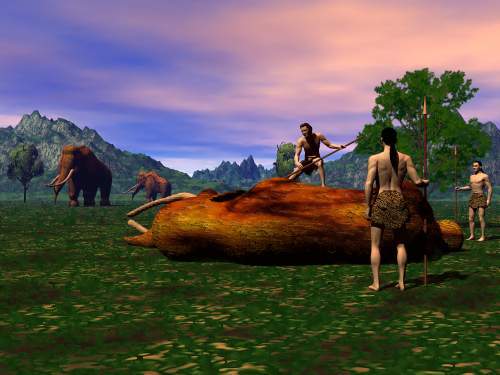 Scientists who disagree with the theory argue that the number of human hunters was too small to have seriously threatened the mammoth and mastodon populations. The Clovis would have have to had killed more than 10 times the amount of animals they would have needed to meet their dietary needs in order to have rendered the mammoths and mastodons extinct. This amount of overkill was unlikely given how dangerous these hunts against these huge animals would have been. Also there is evidence that mammoths found in the famous "Mammoth Trap" of South Dakota also suffered from spiral fractures to their bones even though they died many centuries before early man arrived in North America. Scientists further argue that many other animals not hunted by early man also went extinct at the same time. Believers in the "Pleistocene overkill" theory refute this, suggesting that since the mammoths had such a major impact on the environment of land in which they lived, their disappearance might have caused other species to also go extinct too. Ross MacPhee of the American Museum of Natural History has come up with another theory to explain the missing mammoths: the germ theory. Ross suggests that a deadly disease (perhaps carried by early man) infected the mammoths, mastodons, and perhaps other species, killing them. He is trying to find evidence for this by examining the marrow of frozen mammoths in Siberia looking for evidence of germs. While many scientists think that this idea may be worth considering, until Ross can show some evidence most see it as an unlikely solution, so the search will go on for an explanation for the missing mammoths.